This is not good! 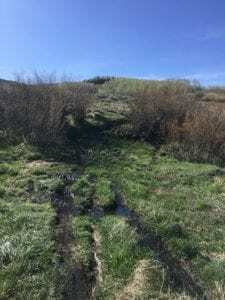 Respect the trails and the land and avoid trails that are wet (like this) and aren’t ready. Ride only open and legal trails. These are signed, designated routes with proper access. If in doubt, it’s probably not a legit trail. Also, no ‘off trail’ or cross country travel is allowed on the Grand Mesa Uncompahgre Gunnison (GMUG) National Forest. Just because there is a faint trail doesn’t mean it is legal for you to ride it. No trespassing! Most private property is signed but even if it isn’t – it is your responsibility to know it is private. Close all gates that you find closed. For wire gates put the bottom of the gate post in first, then use your shoulder to hug the top shut, while holding the fence post with the same hand. Use your free hand to put the wire loop on. Look at them before you open them and put them back the same. This keeps ranchers happy and many places ungrazed and more pristine! CBMBA is working to replace gates with rollovers on popular trails…. roll on! Don’t chase wildlife or livestock, ever. And don’t feed them… please. Yield to horses always! Ask the rider what they’d like you to do. Talking calms the horse, it now knows you are a human and not as threatening. If riding a trail that you know has horses, slow down around blind corners so you don’t come up on one fast. They really respond well when you announce yourself and ask the best way to proceed. Yield to hikers.They have the right of way. Yield to motorcycles. It is a lot easier for you to move off the trail and it keeps the trail single. Plus it is just plain nice. Don’t ride trails that are a total mud-fest. You will just make a mess of the trail. If you leave a tire imprint, you probably shouldn’t be riding that trail. If you find spots of mud or snow, just walk through. Don’t make a new trail around. Please ride your bike to the trailhead. Protect the image of our sport and let’s have the least impact! If shuttling, please pack in as many as you can and ‘drive like your kids live there’. Ok this is a sticky one. Don’t use the trail or campsites for a bathroom. People have even been caught with their pants down right on the Lower Loop, and we aren’t talking taking a leak. Go before you go out, or walk 100 big steps from the trail, campsites, and all water, dig a hole and bury it at least 6″ under! A rock works great to dig with if you don’t have a shovel. In busy places you are going to have to walk a long ways, or better yet take a wag bag or a toilet with your camp. Yield to uphill riders. When you yield just stop, lean your bike off the trail and put a foot down. Don’t ride off the trail and make another trail. Be friendly out there – always. This will keep conflict to the minimum and a smile and good manners go a long way. Here at CORE we train to play. Play means lots of different things to different people but the CORE family enjoys playing outside. That experience is much more enjoyable when people can be happy and share. It’s important to remind ourselves and others that we share the trails with visitors and locals alike. Good etiquette anywhere can create a more positive experience for everyone; on the trails it can also make it more safe. If we all smile and say hello then we can all feel good about our outdoor experience instead of let down by the jerk who wouldn’t even look at us. CBMBA works hard to maintain and improve our trails, I believe it’s up to us, the users, to maintain good etiquette. This does a few things: keeps the trails in good condition for future use, leads by example of how we want others to treat us and the trails, and improves the outdoor experience for everyone.